At first glance, Trolls looks like a lower-rent Smurfs, a sticky-sweet concoction based on a paper-thin premise, designed as a 3-D marketing campaign to push the kids some toys they don’t need right before the holidays. This was helped along, of course, by a ubiquitous Justin Timberlake song that has been pummeling us all since the summer. So granted, Trolls may have a low bar going in, but the movie scales it quickly and admirably by defying conventions, adding both new and familiar musical numbers, and hiding a valuable, Zen-like message in plain sight. The plot is going to sound so saccharine it’ll make your teeth hurt, but here goes: The adorable, sunshiny Trolls are the main food of the ogre-like Bergens, who believe that only by eating Trolls will they be really happy. The Trolls, led by King Peppy (Jeffrey Tambor), escape to a far away pasture, leaving the Bergens in despair. Twenty years later, King’s daughter and lead Troll Princess Poppy (Anna Kendrick) lives a charmed exiled life filled with frequent hugs and lots of singing and dancing. 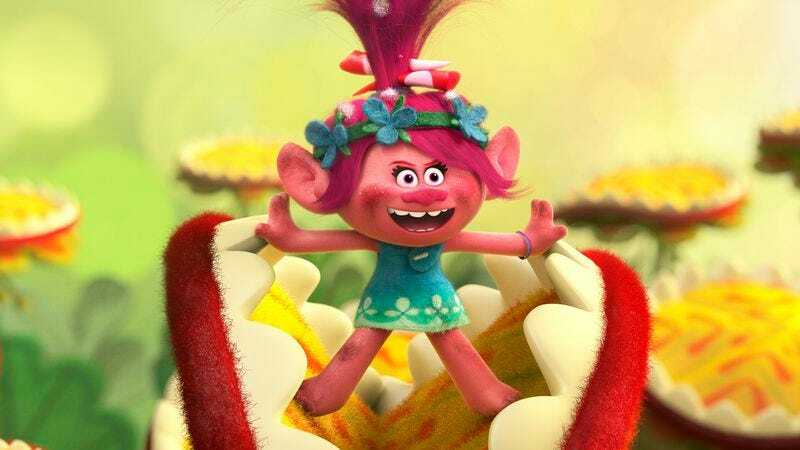 Unfortunately, her loud exuberance helps lead the Bergens right to the Trolls, and she must enlist Branch (Timberlake), the only grumpy Troll, to help save her friends. The asides and departures Trolls takes with this standard plot make it more than worthwhile. Kendrick and Timberlake, whose excellent singing voices have been well-established, volley a buoyant banter between a lifelong optimist saddled with a lifelong pessimist (and vice versa). This leads to some valuable one-liners not only between two gifted performers, but some other witty segues, as when the duo runs into a snarky cloud creature. Trolls was written by Jonathan Aibel and Glenn Berger, who cut their animation teeth on the Kung Fu Panda film series, another effort that is often funnier than most cartoons. When Poppy and Branch finally reach the Bergen’s village, they are greeted with a hilarious, ironically miserable version of the Gorillaz’s “Clint Eastwood.” Things take another interesting turn when the Trolls encounter kitchen maid Bridget (Zooey Deschanel), who pines for Bergen King Gristle (Christopher Mintz-Plasse) with a downright heart-wrenching cover of Lionel Richie’s “Hello.” Trolls being Trolls, they can’t leave without helping Bridget get what she wants, but if the Bergens really want to eat the Trolls, how can everybody get what they want? Where a lesser kids-marketed movie (frickin’ Smurfs) may take the path of least resistance, this is where Trolls, which has already garnered a lot of goodwill by this point in the movie, raises things another level. The Bergens are focused on eating Trolls because they believe that’s the only way they’ll be happy, but what if that’s not the only way? What if—and here’s where the world lurches—happiness is inside you already, and not based on a material thing you can buy, or even something you eat, or drink, or take? Trolls winds up transforming from a prospective toy commercial to a spiritual lesson about being content with what you already have. Kids will walk out not only in love with the songs and the characters, but hopefully having absorbed a valuable lesson about materialism and possibly even addiction. They’ll probably still demand some of those bound-to-be-ubiquitous dolls by December. 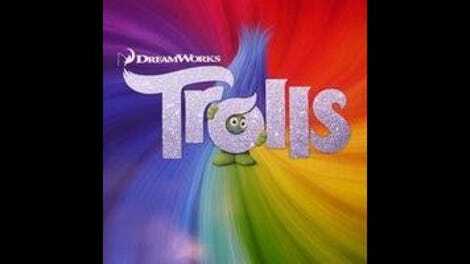 But for a better Trolls souvenir, start with the soundtrack.